Make a credit card gift over the phone by calling Sydney Lockard, assistant to the development director for the University Libraries, at (775) 682-5690. Or call Kristin Burgarello, Executive Director of Development for the UNR Foundation, at (775) 784-4471. To send a gift by mail, print and fill out the donation form, and enclose your check or include your credit card information. Checks should be made payable to the University of Nevada, Reno Foundation with a note that your gift is for the University Libraries. If you wish to direct your support to a particular Library program or investment opportunity, please note this on the donation form. The mailing address is on the form. Donate online through the University of Nevada, Reno Foundation's secure website. 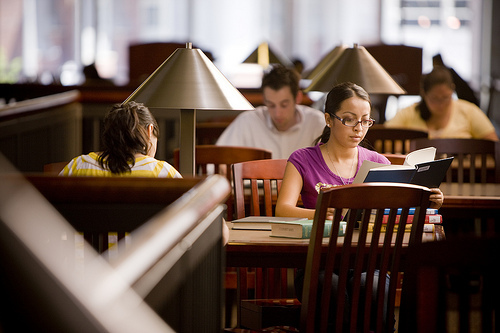 It is important to designate University Libraries as the recipient of your gift. That designation is made immediately under the donation amount on the electronic form. Many employers will match charitable contributions made by their employees that will greatly extend the value of their gifts. Check here to see if your employer sponsors a matching gift program. If your company is eligible, request a matching gift form from your employer and send the completed and signed form to Kristin Burgarello. The University of Nevada, Reno Libraries do not accept gifts of books, journals, magazines, or audio/video tapes/CDs/DVDs. See our policy. To include the University Libraries in your Will or Trust, make a gift of stock, establish an endowment or learn about other gift opportunities, please contact Kristin Burgarello, Executive Director of Development, at (775) 784-4471 or kburgarello@unr.edu.